The Crossrail PIS & Windscreen Jig has been designed and developed for a local midlands based rail client working on the crossrail project. The purpose of the jig is to replicate the LED display and windscreen location on the forthcoming train carriage design. The solution will allow the team to demonstrate and assess any potential glare concerns on the windscreen in a range of lighting conditions (natural and artificial) while setting the jig at a range of heights. -Solution must support the windscreen and PIS LED display as per the final cab design: Windscreen shall weigh approximately 120Kg, PIS Display shall weigh approximately 7Kg. -The jig shall be height adjustable. -The jig height adjustment shall result in the bottom of windscreen being adjustable between 1.1m and 1.5m from the floor. -The jig height adjustment should be able to be set easily at heights: 1476mm & 1134mm, as this reflects a typical height from a typical and worst-case platform. -The jig shall be moveable. -The jig shall have a sufficient mechanism for securing the windscreen glass to ensure that the windscreen does not move within the jig or is not damaged during installation. The framework has been designed to support the front cab windscreen and replicate the correct angle as per the final cab design. A small amount of adjustability has been designed into the solution to ensure this is achieved exactly. This frame work has been manufactured from 30 x 30 square box section which will support the windscreen and LED display. Nylon inserts locate and adjustable feet will align the windscreen secure the windscreen in place. Below the framework a manually operated lifting table allows the jig to move up and down to set the different heights. A take off height of 450mm to 1100mm has been specified with a range of 650mm. A meter stick has been positioned next to the windscreen to provide accurate measurements for test results. 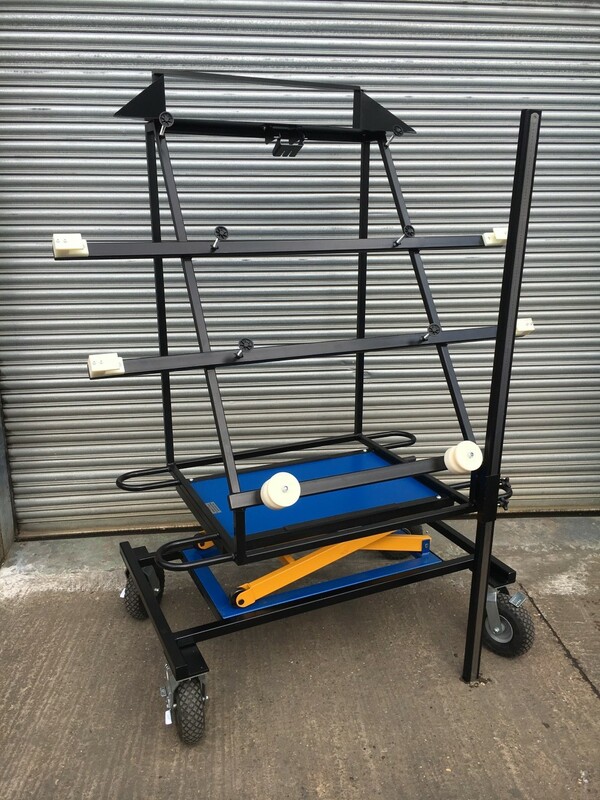 The load capacity of the lifting table is 300 KG.